Artificial Sweeteners and Diabetes: Are Sweeteners Good for Diabetics? Do Artificial Sweeteners and Diabetes Mix? Are you craving a Pepsi? Wishing you could have a box of chocolates from your sweetheart? It’s so hard to go through life with a sweet tooth when you’re diabetic. There are, however, some options to help make life a little sweeter while not making your blood sugars skyrocket. Artificial sweeteners are one option to help you to feel satisfied with a “treat” but not overload on sugars and carbohydrates. Artificial sweeteners are at least 100 times stronger than actual sugar, so very little is needed to create that sweet flavor you are craving. They are also typically considered a “free food” with no effect on blood sugar. But, just because a product states that it is “sugar-free,” “no sugar added,” or “reduced sugar,” it does not mean it has no or low carbs. It’s important that you always read the nutrition label before deciding on what to eat. Stevia (Sweet Leaf, PureVia, Stevia in the Raw, Truvia) is one of the newest sweeteners, and it has been rated GRAS (generally recognized as safe) by the FDA, so it does not need FDA approval as a food additive. Many people prefer it, as it is a natural sweetener derived from the leaves of the stevia plant. Not all sweeteners are equal when it comes to cooking. The best ones to use for cooking are saccharin and sucralose, as they generally tolerate the heat better than others. I personally bake with Truvia. When cooking with these sugar substitutes, you need to be very careful to read the directions for conversion rates. Remember, these are 100 times (or more) sweeter than actual sugar so one teaspoon of sugar does not translate to one teaspoon of a sweetener. You may also notice that since the product won’t have as much bulk to it, you might get less volume. In addition, depending on the recipe, some foods could have a bit of an aftertaste. If you want to cook at home with sugar substitutes, it does take a bit of trial and error, but I have found some amazing recipes on Pinterest that make me feel like I’m not missing a thing when it comes to desserts. Can Artificial Sweeteners Make Me Gain Weight? This question has certainly been a topic of debate over the last few years. While the sweeteners themselves will not cause any weight gain, the effects of using them could. If you are still getting more calories than you should be eating than you will still gain weight or will not lose weight. If your goal is to use the sweetener to lose weight, you need to still count all the calories. There is also some research that suggests using sweeteners may have sort of a dulling effect on your sweet tooth, causing you to actually crave more sweet items. If this happens, you may go over your calorie count and your weight will rise. Moral of the story — know why and how you are using the sweeteners in your diabetic diet plan. Can Artificial Sweeteners Cause Diabetes? This really works with the question above. While artificial sweeteners themselves do not cause diabetes, they can trick your body and brain into doing the things that may cause diabetes. Using the example above, if you think drinking diet soda allows you “extra calories” to make poor eating choices like cake, other desserts or snack foods on a consistent basis, then you are still putting your body at a higher risk of diabetes by consuming these sugar-spiking treats. 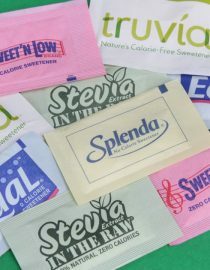 I Heard Artificial Sweeteners Cause Cancer — Is That True? Aspartame and sucralose seem to be under the most fire for having negative side effects. While they have been proven to be safe for daily consumption up to a certain amount per day, there is not enough evidence at higher amounts (which a lot of people consume) to make a truly educated guess. People have reported various side effects for sweeteners, including headaches and diarrhea. If you have concerns, talk to your doctor or nutritionist to see what they suggest as the safest sugar substitutes as the research changes frequently. Train your brain to see fruit as a treat. Many fruits have a low glycemic index, so you get that feeling of having something sweet but your sugars don’t spike afterward. Look for an apple or a handful of grapes or cherries instead of a Snickers bar after lunch. Raw honey is not only good for your allergies, but it contains a multitude of cancer-preventing antioxidants. Honey is also low on the glycemic index, so it’s a good sweetener option. It’s perfect in tea, cereal, yogurt and even on toast. Dare I say it? Use real sugar. If you are concerned about the possible effects of sugar substitutes, use real sugar as a sweetener — but be sure to count the carbs and portion sizes. There are 4.2g carbs in one teaspoon of sugar; that might be just enough to sweeten your coffee or tea without needing the pink packets. When you have that craving for a little something sweet, you don’t need to completely deny yourself the sweet life. Just be sure that the options you choose are the right ones for you and your nutritional goals. As always, ask your doctor and nutritionist for suggestions. You've probably heard diabetics should avoid fruit, while at the same time hearing fruit is healthy and you should eat more. Can diabetics eat fruit or not?